While it’s raining cats and dogs in the city, it doesn’t mean that your pets should be out in the monsoons, unless they need to do their daily business. While some pets love to play with water, most of them dread it. But for us, walking our pets in the wet weather is a necessity but also has its drawbacks, so it’s best to keep them out of the rains. Also, it’s the perfect time to give them cuddles, since it helps to cope with the bad weather and thunder. Anyhoo, here are 5 ways you can help your furry babies this season. You take all the effort to cover up during the rains, with wellies, coats and umbrellas, so why not give your pet the same treatment? Raincoats for pets are easily available and can even be bought from big pet stores. Vests and jackets are the rages now because they cover the underbelly which is prone to getting wet faster than anything else. So, make it a pleasant experience for your pet when they have to heed the call to nature. Save your pets’ paws this season by indulging in some rain boots. Available for both cats and dogs, these rubber shoes are generally available in all sizes and a variety of colours. Honestly, we’ve gone and picked a matching pair of raincoat and gumboots for our babies to make them feel special. We recommend doing the same! 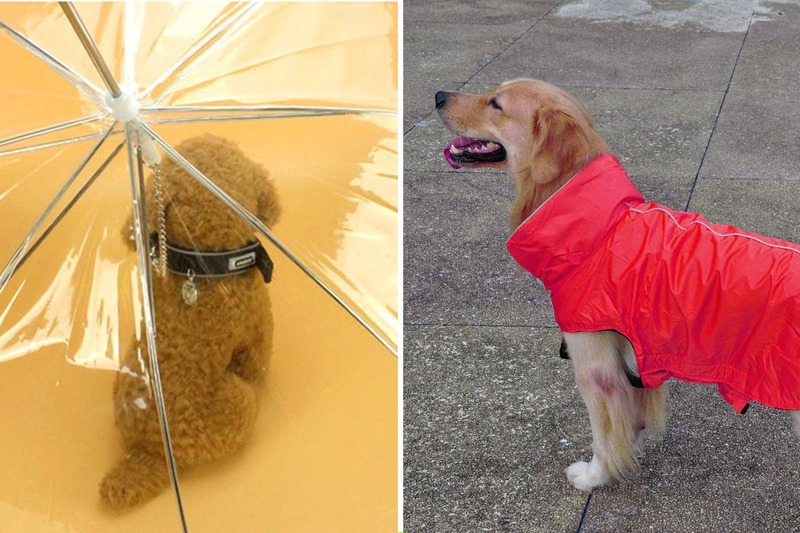 This is probably one of the coolest finds – an umbrella that you can hold that’s attached to the leash, so your pet is protected from the rains. So far, the only design is transparent plastic, but it’s still a blessing. It’s an easy thing to manage too, where you simply hook the built-in leash to the collar and hold the umbrella up. Monsoon’s the season where you furries suffer from illnesses or even a flea or tick infection. There are a number of products that can help combat this problem – from ultrasonic tick and flea repellers to sprays, soothing shampoos to even spot ons and collars – you can see what suits your pet best. Always handy to have around, pet towels and wipes are a blessing when it comes to the monsoons. Clean your babies up once they’ve come back from their walk or wipe their ears and paws from getting an infection this season. We recommend you add some Apple Cider Vinegar to your pet’s diet, or just use it like a spray (add water and apple cider) and spray it on their coats. It will help keep them tick free.